With its adjustable attack angle* and articulating A-frame, the ALL-NEW stainless steel FISHER® HDX™ snowplow takes straight blade innovation and productivity to a whole new level. Available for both pickups and as a skid steer plow, the HDX™ is a whole new way to attack winter. 8' 29" ** 14 4 8 1½" x 12" 7' 2" 861 lb Optional 1/2" x 6"
9' 29" ** 14 4 8 1½" x 12" 8' 1" 902 lb Optional 1/2" x 6"
** Blade height shown is for the 55° attack angle. The 65° attack angle blade height is 28.5" and the 75° attack angle blade height is 27.0". 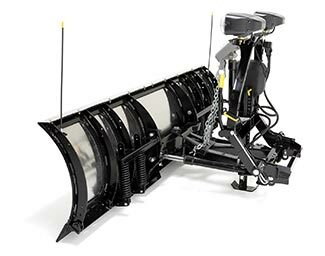 The HDX™ snowplow features an adjustable attack angle that allows you to customize the blade’s angle of attack based on plowing surfaces, weather conditions or operator preference. Choose 55° for gravel or unpaved surfaces, or for scooping deep, heavy snow. Choose the 75° angle for asphalt or paved surfaces, and for scraping up ice and hard packed snow. Or choose 65° for the ultimate in plowing versatility. 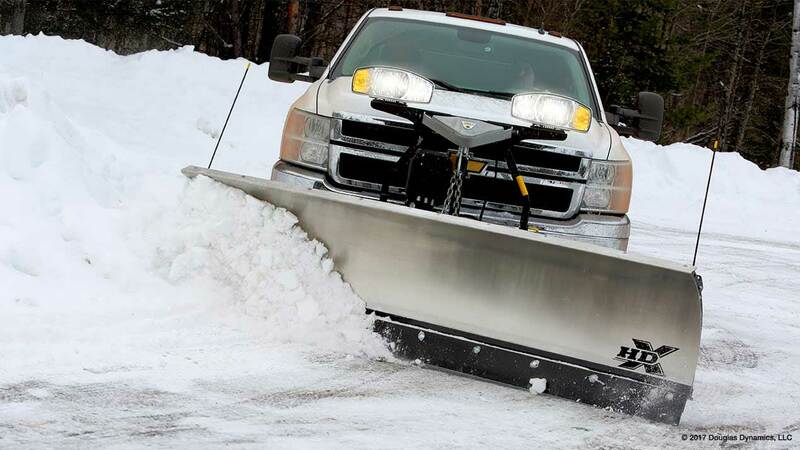 With an articulating A-frame, the HDX™ snowplow pivots from side to side for a cleaner scrape. The design allows the blade to follow the contours of the plowing surface and helps the cutting edge wear more evenly for longer life. The system is built on a heavy-duty steel pivot beam for superior strength, and features a 1" diameter pivot bolt for rugged reliability. A stabilizing leaf spring helps keep the mounting points level with the plow for easy drive-in alignment on uneven surfaces. 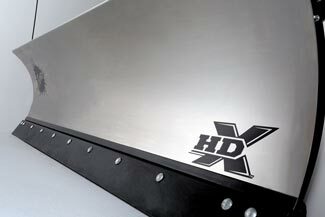 The 29” tall, stainless steel HDX™ snowplow blade is made from premium, corrosion-resistant stainless steel. Available in 8’ and 9’ widths, the corrosion-resistant stainless steel moldboard provides the ultimate in durability and performance, while also looking great on your truck. The HDX™ snowplow is constructed with 8 heavy-gauge steel ribs, with 2 reinforced inner ribs, welded into a ridged framework for maximum structural support. A standard ½” cutting edge made of high carbon steel provides extended cutting edge life. *Attack angle adjustment may be limited on certain vehicles due to varying vehicle heights. Refer to your snowplow Owners Manual or FISHER® eMatch system for more details.